We want to learn Spanish at our house! And since we live in south Texas it would sure benefit us. We have a few programs that we’re going to use this year. Curly has been using this on the computer at times when I’m working with Tiger or Bee. She really loves the Spanish program and has done well with the lessons. I think we’ll be getting the kids their own laptop so they can do some computer learning activities during school. My goal is for Curly to work on a lesson 3 times a week on her own. She’s made it through the first part of level 1 so we’ll continue on with the lessons. We started using this program last school year and didn’t finish as we got busy with all our moving preparations. I think we’ll pick up where we left off and keep working through it. All the kids enjoyed the songs and learned quite a few vocabulary words through them. 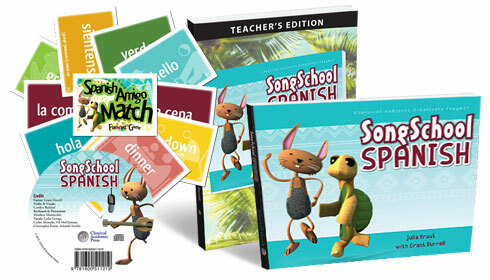 The program is fun and a painless way to begin learning vocabulary words and a few sentences. This is something that everyone will use together. I think by the spring Curly will be ready for something a little more challenging in Spanish – a program that includes some more explicit grammar instruction. I’ve heard great things about this book so I think we’ll give it a try later in the year. It looks open-and-go and very easy to use. Good luck! We used "Getting started with Latin" with my son. It was nice, but I still explained things beyond what was in the book while we worked through it. And we always reviewed the previous pages before advancing to next ones. I felt like the reviews were most helpful when done with this book.